UPDATE: After Cooking Light published this story yesterday, the mystery shopper stepped forward to share more details over Twitter. Grace Goldstein is the D.C. local who discovered a dead lizard sprawled out in her bag of Trader Joe's kale on Tuesday. This Person Found an Entire Lizard in Their Trader Joe's Kale https://t.co/g1MVyuCp08 via @Cooking_Light glad you’re better at twitter than I am @KateBerner ! I firmly stand by the fact that lizards are not the green I was looking for when I got this kale! People magazine saw Goldstein's Tweet directed at Cooking Light and asked her to share more details about the horrifying discovery, and now we've learned just how the whole ordeal went down. 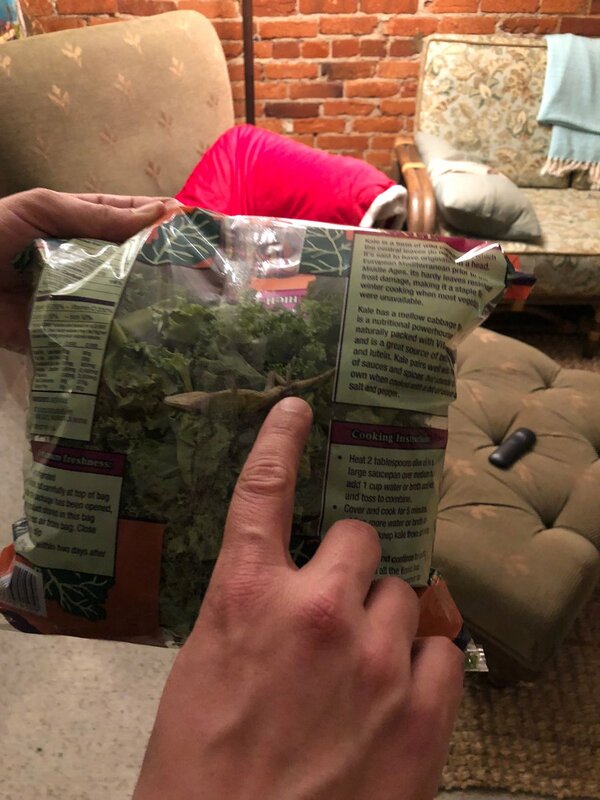 “It was a back and forth between denial and horror, which amounted to a lot of asking my boyfriend to see the bag of kale and identify the lizard and shrieking and pushing it away and refusing to go near it…and then asking to see it again,” she told People. Goldstein was torn on what exactly she should do with the kale—we originally suggested she might use Trader Joe's shopper-friendly return policy to her advantage, but she ended up sticking the kale (and the decomposing lizard) into the freezer. “It’s a little too close to my late night ice cream for comfort," she says. Goldstein says that she has formally reached out to Trader Joe's and that the chain is looking into what possibly led to the lizard ending up dead in the kale, but the psychological damage might far outweigh anything else. She shared that she's off kale for now—"I’m really into spinach now." Kenya Friend-Daniel, the public relations director for Trader Joe's, shared this official comment in an email to Cooking Light this morning. "We are committed to providing customers with great products of the highest quality and are currently working with our vendor to look into and address the matter." There's nothing like ripping into a bag of fresh kale (possibly even at breakfast)—but one shopper's bag from Trader Joe's housed a surprise: A tagalong that probably snuck in during production. Yes, a full grown lizard can be seen lounging in the bed of greens. The photo surfaced on social media platforms after the shopper sent a snap of the horrifying discovery to friends, including one Kate Berner, a D.C. local who couldn't help but share the goosebumps-inducing image with the whole world. "I’m the number 1 #traderjoes apologist," she writes, alongside a clear photo of the sizeable specimen, "But this lizard in my friend’s kale isn’t great…"
We have a lot of questions for Kate and her friends—like, is there a small chance that the little guy is still alive?! And did the home cook throw out the bag—or share the discovery with the crew at the local Trader Joe's where it was purchased? The bag appears to be Trader Joe's standard pre-washed, pre-cut kale, which retails for $2.29 in stores. Not that we'd wish this on anyone, but Kate's photo reminded us of the store's amazing return policies. You can return anything that you have tried and don't like (whether or not it contains a reptile), even without a receipt and/or if the product is already open. We are sure that this bag of kale qualifies for a speedy return. Maybe try their kale chips, instead? Sadly, this is not the first time the Internet has been horrified at such a discovery—earlier this year, a woman in Maine found a full-bodied blue-belly lizard in her chopped salad mix (missing a tail, which she's unsure if she ate or not). And we're sure it's not going to be the last, so if anything, we're all now fans of an extra lettuce wash...just in case.